We're excited to announce the launch of our New Appointment Workflow! We've made appointment processing faster by bringing all your appointment tasks into an intuitive flow that lets you quickly see where you need to start or or easily pick up where you left off. Our redesign includes an updated user interface and new features to help making appointment processing easier in Silversheet. Appointment tasks are now available in an easy to follow step-by-step workflow. You can reorder the workflow steps to align with your process. Completed steps are marked green so you can see where you are in the appointment process at a glance. 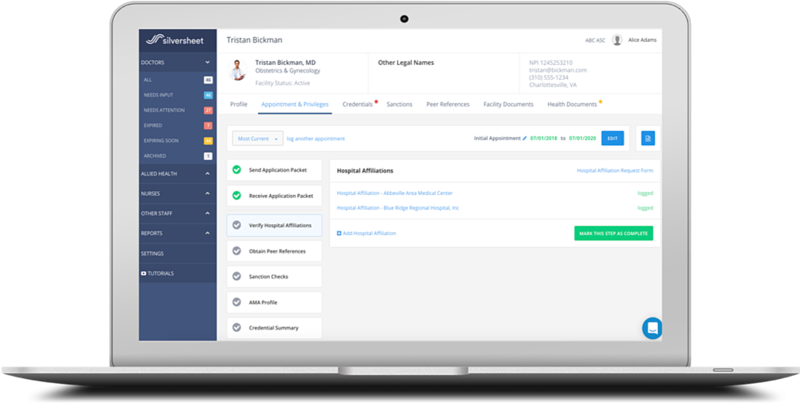 Automatically generate a Hospital Affiliation Request Form in Silversheet, eliminating the need to manage these forms manually. Send a summary of privileges to the provider with our new Delineation of Privileges Form, now available to send with the Letter of Appointment. We've given you more control and visibility for your appointments by showing you the type of appointment you're processing and letting you change it at any time. You can now configure the required number of Peer References based on the type of appointment you're processing.